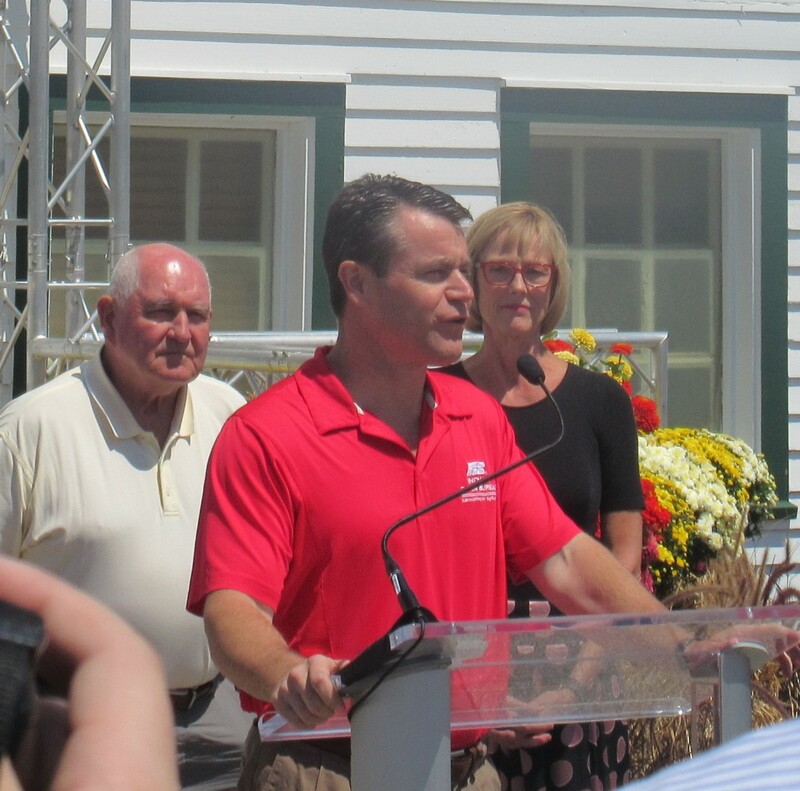 Indiana State Fair 2017 Photos, Part 1: The Farmers’ Surprise Press Conference « Midlife Crisis Crossover! This year we ran into something we hadn’t expected: a very special appearance by a member of President Donald Trump’s Cabinet. Not exactly a common fairground attraction. The diversion started innocently enough: we exited the fair’s Glass Barn, looked to our left toward the fairground’s north end — usually covered in rural sights and exhibits easily overlooked if you stick to the main straightaways — and saw a barn I’d never noticed before with activity around it. I figured we’d go investigate and see if it contained farm animals, museum displays about the history of farming, barnyard snacks, farmer cosplayers, or whatever. Not till we got closer did we notice a few folks standing in front of it, armed with expensive cameras on tripods and wearing the kind of business clothes no one wears when they’re about to buy elephant ears or drive bumper cars. Best-case scenario: ponies inside! Or Indiana unicorns! As more news professionals approached, one nice lady — who shared Anne’s issues with taller people in front rows blocking her views — filled us in on what was about to happen. 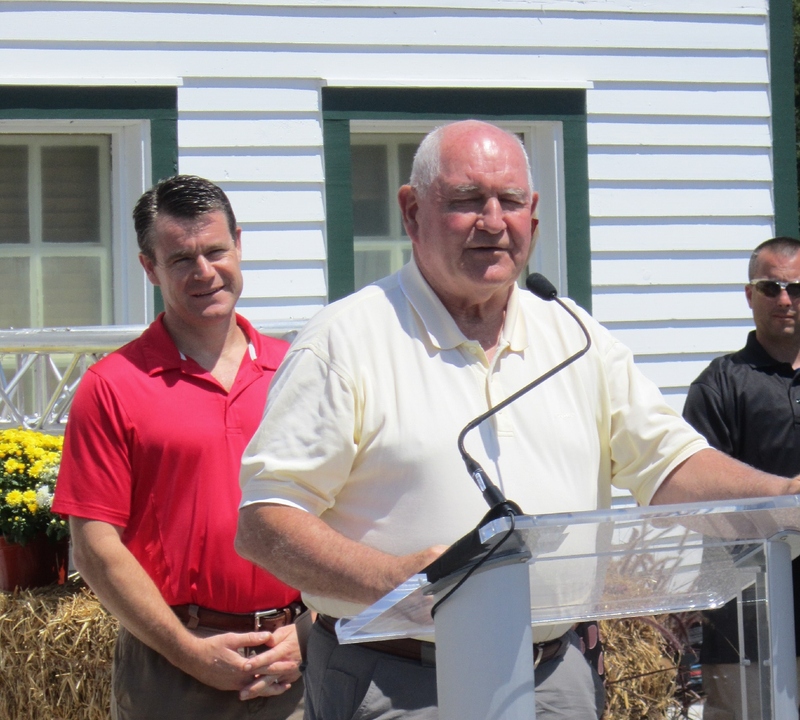 US Department of Agriculture Secretary Sonny Perdue was wrapping up a five-state tour with a roundtable discussion starring local politicians, farmers, and others of note that was closed to the press and public. Perdue’s objective with his various meetings was open communications about agricultural issues and some kind of farming bill that’s about to go before Congress and presumably contains stuff and things that might affect farms, farmers, and farming accessories. Or something. Look, Anne’s the politically minded one in our household, so the finer details are lost on me and weren’t mentioned in depth at the podium while we were there anyway. 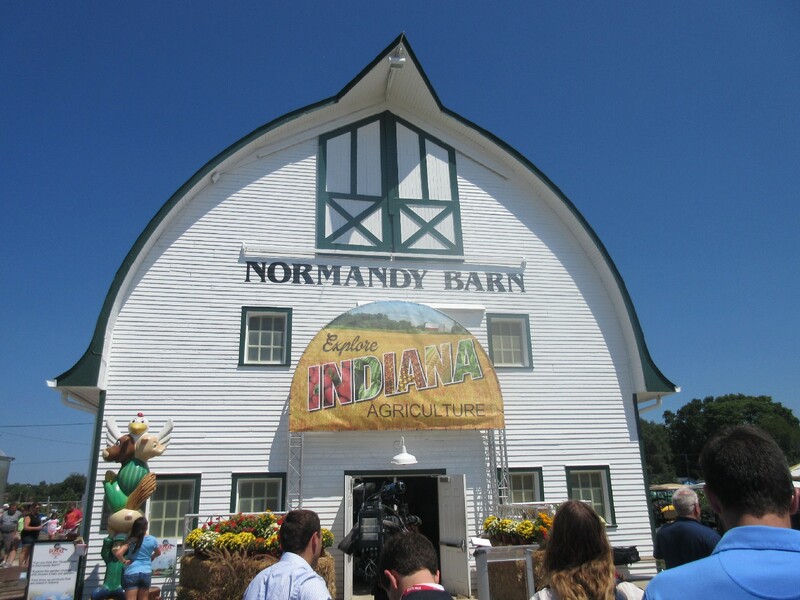 Shortly before 1:30 the primary players emerged from the Normandy Barn and commenced conferencing. By this time the sun was high in the sky, the shade was scarce, and everyone who wasn’t used to spending hours toiling in sunshine was sweltering. That, more than any other factor, may have been why our pics weren’t all smiles and pep. I was dying even in T-shirt and shorts after standing by for nearly half an hour. I can’t begin to imagine how the reporters and other suited staffers around us were coping and not passing out. Let the pressing and the conferencing…begin. Besides intros from minions, the speakers numbered five in all. 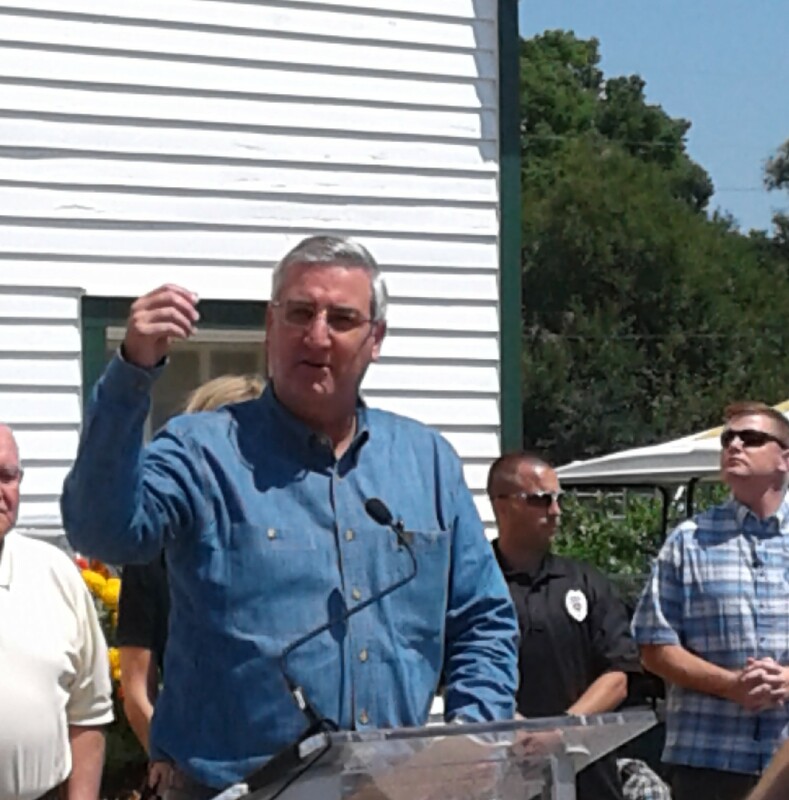 First up was our own Indiana Governor Eric Holcomb. 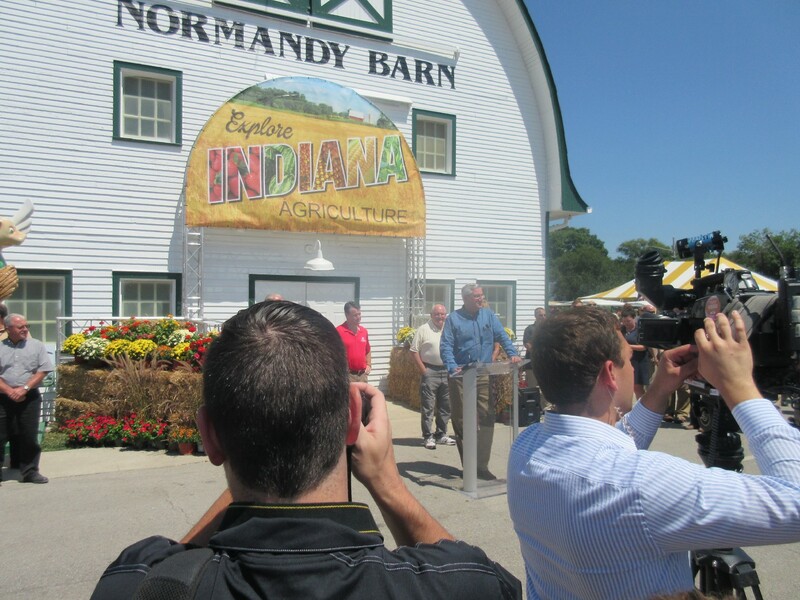 We last saw him from afar at last September’s Indiana Bicentennial “Hoosier Homecoming” shindig. Maybe this sounds weird, but he was much taller in person than I expected. Next up was US Senator Todd Young. Mind you, I didn’t write down much of what anyone said, which was largely intros and thanks. But here they were, and here we were, noting the moment for the record because this was officially Something You Don’t See Every Day. This was our first time seeing Young in person. All I know about him is I hated his campaign ads. 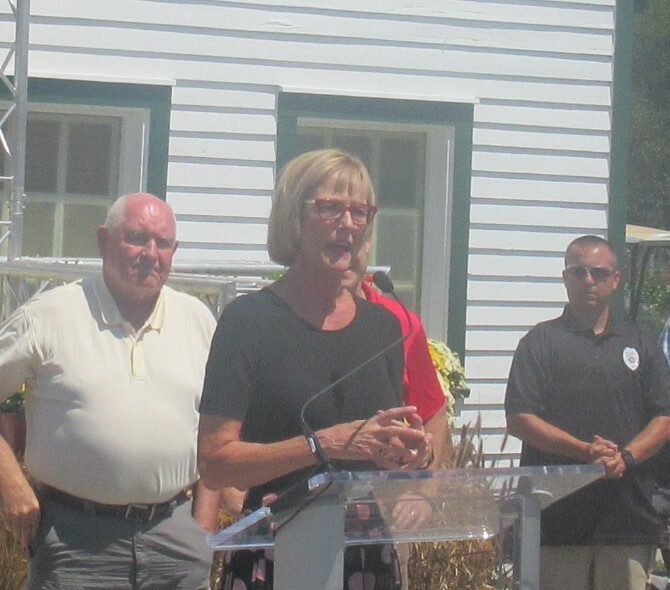 After Young was Lieutenant Governor Suzanne Crouch, whom we last saw at the aforementioned September event, two months before the election when she was still State Auditor. Her life’s upgraded a tad since then. At the Hoosier Homecoming she even spoke to us and posed with Anne for a pic! She probably didn’t remember us, though. That’s…uh, y’know, I guess that’s cool. 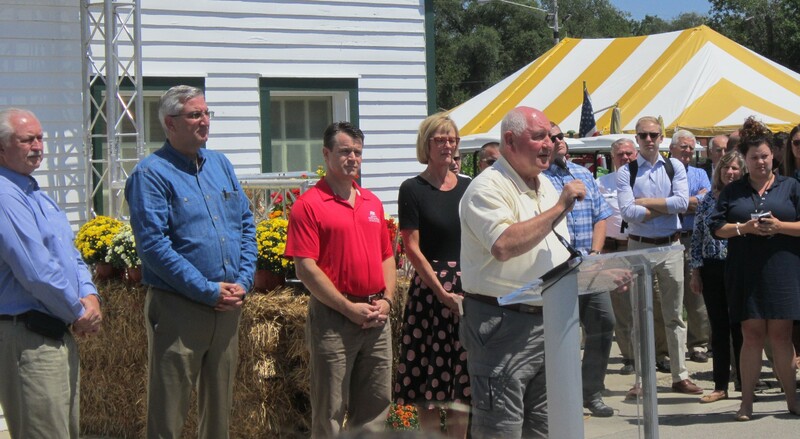 Last and foremost was Sonny Perdue himself. I’d honestly never heard from him and consider myself educated if I can name more than three U.S. Cabinet members in any given year. My understanding was further complicated when the helpful reporter mentioned his name and I thought she was referring to Purdue University, which I know has an agricultural program. The next few fair-goers who approached and asked me what was going on were then unknowingly treated to a piece of poor “Who’s on First” knockoff in which I told them we were about to listen to a guy from Purdue, which didn’t impress them much. Before he was approved for the position, Perdue previously served two terms as governor of Georgia and had a small role in the film We Are Marshall. And now here he was in our fair city, drumming up support for that bill and assuring anyone in attendance that farming is extremely necessary. I can confirm the Indiana State Fair was exactly the right setting for this message, stationed as we were on the north end of the fairgrounds by the gigantic farming equipment displays and copious barns and whatnot. At the podium he seemed like a friendlier Lawrence Tierney. His initial statement was short, followed by a Q&A inviting questions using terms like “TPP” and “NAFTA”. By this time we suspected the potential lay ahead for political or ideological conflict even in the context of farm chat, plus we were withering in the direct sunlight and yearning to return to our quest for foods. We took our leave and freed up space for other passersby to get in closer and start Instagramming Governor Holcomb and the rest to their heart’s content. Hopefully nothing too contentious occurred after we left but what’s the worst that could’ve happened! 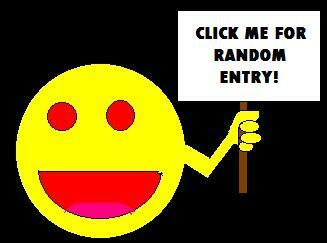 And now having typed that, I’m afraid to check Twitter in case I’ve just jinxed everything. Dreadful sorry if I did. To be continued! Next time: fair food pics, we swear!